First Grade: Ready, Set, READ! Ready, Set, READ! is a literacy program designed by the West Bloomfield Township Public Library especially for first graders and their parents. This program will guide you through the library's Easy Reader collection and offer many suggestions so that you can help your child learn to read at home. Easy Reader books are designed to challenge a beginning reader and give them practice as they become more fluent readers. First grade is an exciting time. 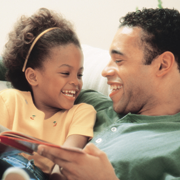 Help your child to get read, set, and read!